I’ve been interviewing folks for two decades. Print. Video. Web. Podcast. You name it. And one of the most tedious parts of writing and publishing is: transcription. The medical and legal world have conquered the transcription beast with special software and recorders. But for the rest of us, it’s been a pain. Why are transcripts still so important? I’ve been developing a new electrical industry publication that involves a lot of interviews with influencers about technology and automation. I’ve been recording these interviews—often over the phone last minute, so the quality isn’t great. 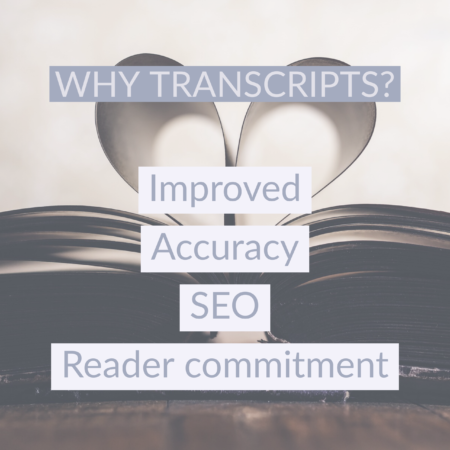 Since the information is highly technical, transcription is important because I want to make sure the details are accurate. After starting the laborious transcription process of listening and typing, I decided to research and see what new resources are available to help. I found a lot of slick tools with varying price points. I personally tried out three of the most highly rated apps based on feedback and recommendations from others online. Most of these are online tools or apps with desktop and mobile interfaces. Free trial for 7 days. Provides an audio player that’s tightly integrated with a text editor on the same screen. Many transcription tools, like 2x to 3x speed up, keyboard short-cuts, rewind button and accurate dictation. Transcribe’s approach is that automatic audio to text conversion is flawed. It doesn’t work, and that has been my experience. This app is designed to make it as easy as possible to transcribe manually. I tried Transcribe’s recommended approach of putting on headphones and speaking the text aloud using their dictation tool. It worked exceptionally well and was significantly faster than typing. I also tried typing the transcription. I found the apps tools to be very helpful, and I found it much less tedious than previous ways that I’ve used to transcribe audio to text. I especially liked that a lot of their tools were customizable. You can change the speed of the audio in small increments, so you can listen to 1.3x speed if you’d like. You can also customize how many seconds back the rewind button takes the audio. Nice. Love it! I bought a yearly subscription, and I feel like it’s a good value. Free trial that enables you to upload 30 minutes of audio or video. Provides an online audio editor with back button and speed controls. Costs $15/hr. on the Pay as You Go plan. Also has $40/mo. and 120/mo. plan that each have limits on how many hours you can upload, but do provide rollover on unused hours. For the free 30 minutes of audio, I uploaded an interview that was 34 minutes long. It said the file was too long and wanted me to pay for it. Ugh. I hoped that it would let me listen to the first 30 minutes and then just restrict the remaining 4 minutes. Wishful thinking. So I figured out a way to trim the audio file back to 30 minutes and re-uploaded it. The automatic transcription was completed pretty quickly, probably in less than 15 minutes. Unfortunately, the audio in my interview resulted in poor transcription results. Unusable. I was back to manual transcription. The online interface is pretty and has some nice tools, like graying out the text that you’ve already listened to so you can keep track of where you’re at in the audio file. It also displays time code and has a 5-second rewind button. I didn’t like that the limited speed playback controls of normal 1.0, 1.5 or 2.0 speeds. If I had a crystal clear recording, I’d consider paying $15/hr. to have it automatically transcribed. 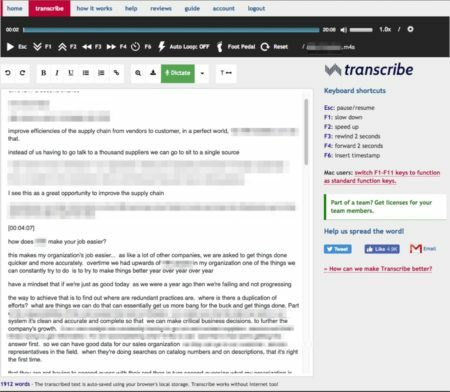 I liked Trint’s online editor and tools, but I liked Transcribe’s better. And Transcribe was much more affordable. I’ll keep this as a back up option. Free trial that enables you to upload an audio or video file. Costs $.10 per minute or $6/hr. Temi is slick and easy to use. You can easily upload a file for the trial. The automatic transcription comes quickly through an online link. 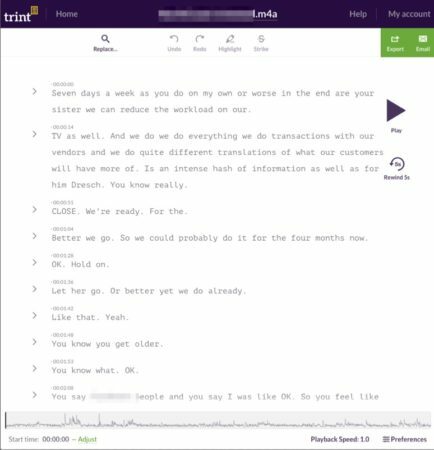 I thought the transcription was marginally better than Trint.com. The interface is attractive, and it has basically the same transcription tools as Trint, including limited playback speed of 1.0, 1.5x, and 2.0x. The Temi automatic transcription, although marginally better than Trint.com, was unusable because my audio interview file was imperfect. So I was back to tedious manual transcription. You can easily edit the automatic transcription, but that is more time consuming than typing from scratch. I did like that the Temi software attempts to identify different speakers for you. I will keep Temi as a back up option. I’ll likely try it again if I have a really clear recording that needs transcription as the price seems reasonable. Based on everything I experienced, I’d rank this as higher than Trint.com. 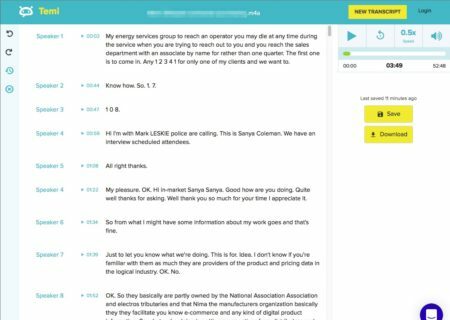 With a tool like Transcribe.wreally.com, nearly any person or organization can easily transcribe their audio and video content. You’ll get better search engine results and can better manage these types of content assets. Sonia Coleman helps marketing teams and leaders build credibility, share successes and increase leads. She and the NeuConcept team focus on technology + marketing, bringing a balanced approach to marketing strategy and technical implementation. Reach out to her at neuconcept.com/contact to schedule a free 30-minute coaching session and achieve a better outcome with your web, marketing & PR initiatives. Copyright © 2017 by Sonia Coleman All rights reserved.